Hole-In-Won.com delivers a wide variety of prize coverage programs for you to choose from, depending on YOUR preferences and YOUR budget. 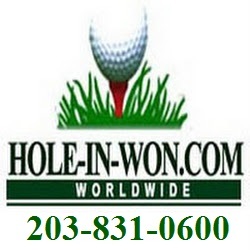 Whether your special program or affiliation is listed or not, please contact your Hole-In-Won.com representative. If we don't already have your program in place, we will work with you to establish one. 1/2 Court-Shots for the Fans and more. GET on Local TV, Internet, You Tube and even ESPN with a winner !! Give away . . . ANY MODEL, Lease Plan, Money, Scholarships & more! Starting At ONLY $200! . . . Contestants WIN . . . WE PAY for the PRIZE! BASKETBALL CONTEST INSURANCE . . . Let us show you how . . . to promote at ANY BASKETBALL Event . . . INCREASING ATTENDANCE w/ SALES . . . even FUNDRAISING $$ . . . if desired . . . in any economy. 24-25-30 Second Shot Series: Make 1-Lay-Up. 1 Free Throw. 1 3-Pointer & 1 Half-Court. YOU WIN! 3 Point-Shoot-a-Round: Make 7 3-pointers. YOU WIN! 3/4 Court or Full Court Shot: Make 1 shot from Full or 3/4 Court. YOU WIN! 2 out of 3 from 1/2 Court or 1 Shot: Make 2 of 2, 2 of 3 shots or just 1 from Half-Court. YOU WIN! 2 Shots - One to Each Basket: Pick a Spot on the Court. Make a Shot in Each Basket. YOU WIN! 7 out of 10 3 Pointers: Or Pick the Number. also Free Throws. YOU WIN! GUESSING GAME FUN: Pick the Exact Score. Team wins by x # of pts. YOU WIN! TEAM "Contingency" EVENTS: Beat yer rival by x amount. Brackets. Triple-Doubles & more. YOU WIN! NERF and FRISBEE TOSS: Thru the Basketball rim - or to & from any Place in the Arena.YOU WIN! INDOOR PUTTING Contests: We supply the Hardwood FRIENDLY Indoor Putting Cup! Biddy to Pro. BENEFIT the Team, the League or a Charity. Combine with Radio, TV, Newspaper. WIN WIN! and . . . WE ALSO CUSTOMIZE CONTESTS for ANY BASKETBALL IDEA ! As always, Best of Luck to You & Your Dealership . . . WE APPRECIATE YOUR BUSINESS! . . . Feel free to Contact us with . . . ANY questions or Special requests . . .
203-219-3090 Cell Phone . . . If Anytime Assistance Needed! Hole-In-Won.com is the Golf Hole in One Insurance company for Daewoo. Charity Benefits and All Outing Preferred Pricing.